Warner Bros. is marketing “Shazam!” as a silly, family-friendly, superhero action comedy with a grinning Zachary Levi in a cartoonish big red suit. Well, “Shazam!” is partially that (in the worst possible ways). But it’s also dark, mean-spirited, foul, stereotypically obvious, blatantly offensive and, at times, depressing. Not “Deadpool”-level inappropriate, but certainly not for the kids audience that the studio is recruiting. Director David F. Sandberg (of horror flicks “Lights Out” and “Annabelle: Creation”) gives us the most disjointed and unethical superhero movie in years. It opens with a 45-minute set-up (no lie). Eventually, bratty foster kid Billy Batson is miraculously chosen by an ancient wizard named Shazam (Djimon Hounsou) to take his place and become the crusader of goodness in the world — or at least in the city of Philadelphia. When Billy says the word “Shazam”, he transforms into the bulked-up Levi. To his credit, the “Chuck” star plays the part he was given: an immature 14-year-old boy who suddenly has amazing powers. If only the material was any good. Billy becomes an instant Philly celebrity. Foster brother and superhero fanatic Freddy has mixed feelings about his new friend. But things take a turn when Billy/Shazam is forced to fight Thad and his monsters, who represent the seven deadly sins. This extensive backstory is the film’s framework. The intentional casting of Mark Strong as the villain just isn’t funny anymore. However, “Shazam!” isn’t simply a Good vs. Evil story. It also deals with such subjects as physical and verbal family abuse, abandonment, bullying — and tries to make light of all of them. 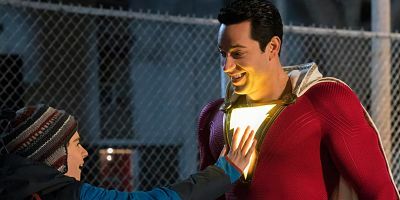 “Shazam!” is a classic case of a movie that doesn’t know what it wants to be and therefore tries too hard to please everyone. It changes genres as often as Billy changes into Shazam. One minute it’s family friendly (think DC’s version of “Ant-Man”), the next minute it’s a heavy relationship drama, and then a minute later it turns into “Game of Thrones”. One thing that’s consistent no matter the tone: “Shazam” is flat-out ridiculous. There’s a scene where the older Billy (Levi as Shazam) and Freddy are at a convenience store buying beer. Two robbers walk in and point their guns at the cashier. Billy goes up to them, and they shoot him in the suit. When Billy realizes he’s bulletproof, he and Freddy come up with the ingenious idea of having the robbers shoot Billy in the face to see if his entire body is bulletproof, not just the suit. Then the men actually shoot Billy in the face. And it’s played for laughs. Did Warner Bros. not do any focus group testing on “Shazam!” before unleashing it on the public? Oh, before I forget: “Shazam!” doesn’t produce a single, genuine laugh. And the script features holes in logic the size of a planet. The song choices, from current pop hits to Queen’s “Don’t Stop Me Now” (technically, a current rock hit) are uninspired. The final action scene (which goes on for no less than a half hour) is relentless. And the obligatory “Big” toy store scene and references to other DC characters are force-fed down our throats. If you’d like to see a film that portrays the foster care system with more accuracy and, dare I say, care, watch the recent Mark Wahlberg comedy “Instant Family”. It’s not for kids, either, but at least it was made with some sensitivity and heart. Everyone involved with “Shazam!”, at all levels, should be ashamed of themselves. On The Official LCJ Report Card, “Shazam!” gets an F.